written and recorded by Dana. Also recorded by Irish singer James Kilbane, Daniel O'Donnell with Susan Boyle as a duet, Tommy Flemming, Moira Crawley and Patrick Feeney.The tin whistle sheet music notes are included. Youtube video included. I love this hymn. Years ago my husband and I were on vacation in the Catskill Mountains and passed through the Irish section, just in time for noon mass. An older gentleman sang this song (acapella} and it was just BEAUTIFU. It would bring tears to your eyes. First time I heard it and have loved it ever since. Amazing song, my daughter had to sing it at school, and I found the perfect site. Beautiful tribute to Our Blessed Lady the Queen of Ireland and Mother of us all. This is a beautiful song that has touched every part of me. I love it so much and I am very happy that I have seen the wordens. My next assignment is to learn it by heart. This was the final song at my mums funeral and was so fitting as she prayed to our lady and she was and always will be our queen. ​Kate O'Neill. ​The first time I heard this song was at a funeral and I fell in love with the song. I now listen to it over and over again and it brings a tear to me every time. It is such a beautiful song. Carol. This is the most beautiful hymn, i feel so emotional when i hear it and it brings tears to my eyes. I have a great devotion to Our Lady she truly is our Golden rose and Queen of peace.Irene. Thanks and I love this song so much! It touches my heart. I heard a soloist sing this yesterday at our vigil Mass which happened to fall on St. Patricks Day this year. 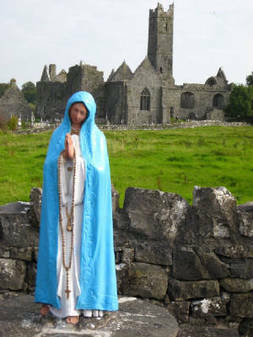 I had heard about our Lady of Knock but never heard this hymn before. It brought tears to my eyes and filled me with such peace​. Kathleen. I watched a program on EWTN this morning and an Irish Tenor sang this song. I never heard it before, but a Friend brought me rosaries back from Ireland and they were from Knock. I came on line to find the song. It made me realize just how much Jesus and Mary love me. Thank you for this site and song. I heard this hymn at my cousins funeral. In April 2017 , I wanted to have it sung at the memorial mass for my husband. Our Lady of knock helped me find the lyrics and music, three choir members learned it especially for him. It made such a wonderful memory for everybody. As our guitarist said, in jest, OUR LADY OF KNOCK rocks. Mary H Zimmer. ​Bless the hymns' lyrics and music, is so well composed. I always hum this to Our Lady, when I am surrounded with trouble and My Lady works for me.